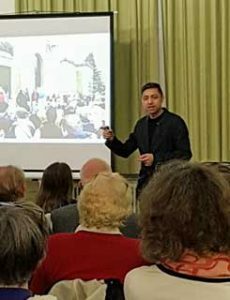 The reliably knowledgeable and entertaining Harbinder Birdi gave a lively talk on John Soane following our AGM on 2 April. Harbinder is a Trustee of Pitzhanger Manor and Head of Infrastructure and Transport, Hawkins Brown Architects. His talk was entitled How the design of Pitzhanger Manor by Sir John Soane has influenced contemporary architecture. He began by talking briefly about 2 massive projects he is working on: the Thames Tideway and Crossrail , with particular reference to the new Tottenham Court Road station. Both projects involve working with artists to incorporate a diverse range of artworks into the architecture. Soane enjoyed the company of the artist Turner, and both Turner and Soane were very much influenced by their travels in Rome, and by classical architecture. The ceiling of the breakfast room at Pitzhanger is, for example, copied from the Roman Pantheon. Soane liked every room to look quite different, and he enjoyed tricks, contrasts, mirrors, arches and artworks. Harbinder went on to show slides of buildings by some of the contemporary architects whom he feels have been influenced by Soane, for example: David Chipperfield, Louis Kahn, Rafael Moneo, James Stirling and Eric Parry and indicated some of the features they have used. He then went full circle back to Crossrail and showed how Soanian features have been employed: colour, artworks, and a variety of styles in the different “rooms” within stations. The audience obviously enjoyed Harbinder’s talk and there were many questions. We tactfully steered clear of asking when the new Ealing Broadway station might be finished.